Weathering will cause these materials to begin to break down. When asbestos-containing materials break, they release asbestos fibers which can lodge in the lungs and cause serious health problems. You will need professional asbestos roof removal in Cerritos CA from a company like AQHI Inc in order to eliminate the health & safety risks posed by damaged asbestos roofing materials. 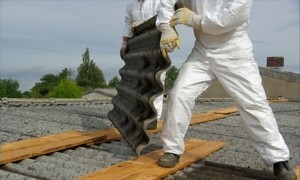 Asbestos roof removal in Cerritos CA is a delicate business that should not be attempted by anyone who lacks experience in adhering to industry best practices for asbestos abatement. The first step in a roof removal is to make sure any asbestos fibers released during the removal cannot enter the building. We do this by sealing all ducts, vents, drains, etc. We wet the roofing materials and remove them in small sections, which helps minimize fiber release. When we’re done with the roof removal, the work site will be clean, safe, and ready for your roofing contractor to begin work. When you work with AQHI Inc. for your asbestos roof removal in Cerritos CA, waste disposal costs will be included in our bid. Our workers will securely bag all asbestos-containing roofing materials as they are removed, and these bags will be collected by an authorized hazardous waste disposal company the next day. This saves you the time and trouble of dealing with asbestos waste yourself. Our asbestos removal office for Asbestos Roof Removal in Cerritos CA is open Monday through Friday between 8:00 AM and 5:00 PM and closed for lunch from noon to 1:00 PM. With advance notice, projects can be scheduled for weekends, early mornings and evenings.